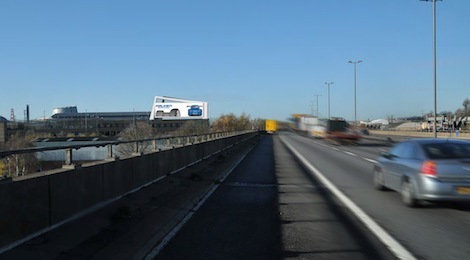 Elonex Outdoor Media has announced it is to construct Star Lights at Spaghetti Junction on the M6 in Birmingham, which is being billed as the largest motorway facing digital billboard in the UK. The super-size structure will deliver 200 square metres of digital advertising space and be located above the Star City entertainment complex adjacent to junction six of the M6. Following an investment of GBP 3.8 million, it’s due to go live in May 2017 and will be known as Star Lights. Designed to be highly visible from incredible distances to traffic traveling both north and southbound on the M6, Star Lights will broadcast advertising content utilising Elonex Digital LED Technology and be focused on delivering more than 20 million audience advert impacts every 2 weeks. It’s an iconic backdrop to the landscape at the busiest motorway junction in Great Britain, and likely to be the most prominent digital outdoor advertising location in the central UK region. It will also be partly solar powered to acknowledge a new dawn at the former site of Birmingham Power Station where it will be positioned within the Star City complex, and will provide a modern, clean and environmentally friendly means of power generation. During the installation of Star Lights, Elonex is to position a temporary digital screen above the M6 at Star City. The temporary screen will start broadcasting in February, before Star Lights is unveiled in May and goes live featuring advertisements from specially selected launch partners. This entry was posted on Sunday, January 29th, 2017 at 20:32 @897 and is filed under DailyDOOH Update. You can follow any responses to this entry through the RSS 2.0 feed. You can leave a response, or trackback from your own site.